Deepmala is the only child of her parents, who wanted to educate her to become a teacher. After her marriage, however, her husband was not comfortable with her going out for studies or for teaching. Deepmala would protest against this, and during one such argument in February 2014, Deepmala’s husband threw acid on her face. 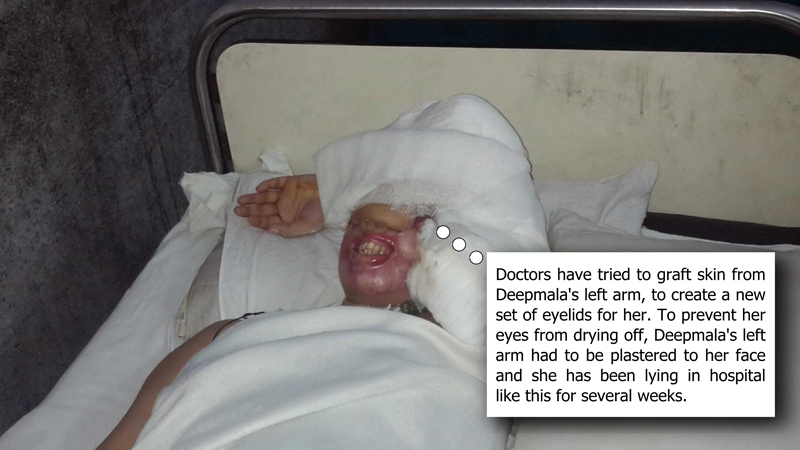 Deepmala suffered serious burn injuries due to the acid attack, which has also left her blinded. 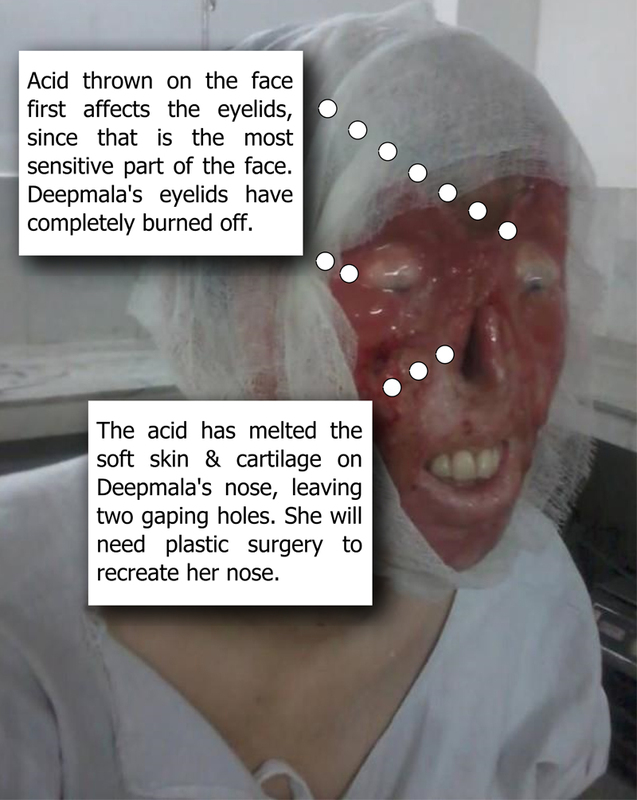 Her eyelids, part of her scalp and her nose have been melted by the acid. She has also suffered injuries on her hands and legs. She has also lost her vision. Her parents come from a poor financial background and her father is a small farmer. They have already sold off a part of their land – their only savings – to meet the expenses for Deepmala’s treatment at a local hospital in her home state of Uttar Pradesh. Her parents are also finding it difficult to meet the expenses of her medicines and hospital stay, which is around INR 25,000 (approx. USD 400) per month. Make Love Not Scars (MLNS) now plans to shift Deepmala to Mumbai, where MLNS has partnered with a senior specialist doctor who is a recipient of Padma Shri – one of the highest civilian awards issued by the Government of India. Make Love Not Scars (https://www.facebook.com/makeluvnotscars?ref=hl)is a unique youth initiative to rehabilitate survivors of acid attacks and other forms of gender-based violence and discrimination and facilitate their integration with society. We are a group of energetic, passionate and committed youth who are keen to make a positive impact on our society through meaningful groundwork. Leveraging social media for our first campaign, we created a Facebook page for acid attack survivor Rekha (https://www.facebook.com/rekha.acidattacksurvivor?ref=hl), which helped in raising close to USD 1,500 for Rekha. We donated the funds to a reputed private hospital in Bangalore, where Rekha is presently undergoing treatment. Later, we raised around USD 3,500 for Rekha through Indiegogo, and these funds are also being used for her treatment. Our next Indiegogo campaign for acid attack survivor Reshma helped raise almost USD 9,000 to fund her treatment. We also managed to raise around USD 1,800 to help acid attack survivor Lalita get a new face. Both Reshma and Lalita are being treated in Mumbai under the care of the same specialist doctor who will also operate upon Deepmala. Deepmala's campaign is the fourth in the series of campaigns for the treatment of survivors of acid attacks. All our campaigns are transparently managed, regularly updating contributors about the total amount collected and details of expenses made. The money raised from this campaign will be used to help Deepmala shift to Mumbai and undergo treatment under the care of a specialist doctor who has been awarded Padma Shri by the Government of India. A part of the funds will also be used to help the family with living expenses. Not more than 5% of the amount collected will be used by Make Love Not Scars to meet administrative expenses. 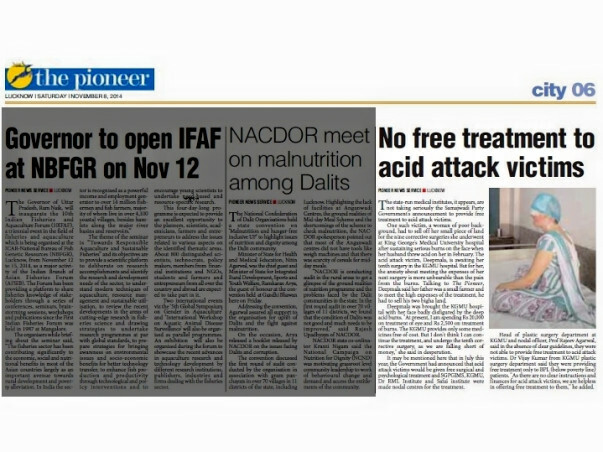 With your support, we can help a young and hopeful acid attack survivor bounce back in life.
" Before I met Deepmala, I didn't really read up her story. All I knew was that she was an acid attack victim. Wanting to be sensitive, I repeated to myself to be as natural as possible and not give any inappropriate reactions. But the minute I met her, she put me at ease, enquiring about the recent floods and general scenario. A little shy at first, and then we struck up a good conversation. Hailing from Uttar Pradesh, she has travelled far for her treatment to Chennai. Her face was completely covered and I could see only a part of her ruined eyes. A slew of operations hasn't dampened her spirits, and the day I met her, she was getting ready for another eye surgery scheduled for the following day. The doctors have decided to restore her vision first before performing any other procedure. Deepmala has spent a couple of lakhs (6-7 lakhs) on her surgeries till now and still has a long way to go. She plans on getting all her surgeries and procedures done in Chennai. P.S: We are unable to share photos of Deepmala with you as she was not comfortable with photographs at this time of treatment. This is to update you that we have withdrawn Rs 40,000 from this fundraiser to help a family of acid attack survivor Usma, who was severely injured in an acid attack in Meerut. (more details here: http://timesofindia.indiatimes.com/videos/news/Seven-of-a-family-becomes-victim-of-acid-attack-in-Meerut/videoshow/47470703.cms). The family has been admitted at Safderjung Hospital in Delhi, our volunteers in Delhi are in touch and are helping the family. The amount is now be given to MLNS volunteer Shaheen's account, as she is helping Usma and her family. The funds will be used to purchase medicines and bandages for the victims. As an update on Deepmala, I would like to inform you all that Deepmala is presently undergoing treatment for eye-lid reconstruction at Sankara Netralaya in Chennai. This treatment has been sponsored by Amar Ujala Foundation, Uttar Pradesh. We will need the rest of the funds collected for Deepmala once she goes back to Lucknow and resumes further surgeries for her face and body at a hospital of her choice. Haseena (acid attack survivor from Bangalore) and I are in touch with Deepmala on phone and I am also planning to visit her. In the meantime, if any of you would like to speak to Deepmala, then I would be happy to arrange a call with her. Thank you so much for your support towards Deepmala. We truly value your kind contribution. After having connected Deepmala to Aijaz, brother of Reshma who is undergoing treatment at Bombay Hospital, we have also connected her to Haseena, who, is also an acid attack survivor and our in-house counsellor at MakeLoveNotScars. Deepmala has zero vision at present, but is able to see flashes of light when light is shown at her. She has hopes of regaining her vision, but first must undergo surgery to reconstruct her eye-lids after the current break. Haseena has been counselling Deepmala saying that she must not lose hope and even if she does not regain her eyesight, she can use audio aids to learn computers and become independent like Haseena. Deepmala has a B.Ed degree and hence, rehabilitation should not be difficult. Once we have had a few more rounds of conversation and Haseena is friendly with Deepmala, we can request for a call to be organised with Deepmala. Our next update, we will try to share the phone conversation with you. Please do let us know if you need any further information or update about Deepmala, and we will be happy to provide. Thank you so much for your contribution and support. Please contact www.Microskin.com.au for discounted remedial Cosmetics for acid attack victims. We might be able to help a bit. I hope she would recover soon.